For complete show notes and episode transcripts please go to http://brainsciencepodcast.com. To win an Amazon gift certificate: post a review of Brain Science in iTunes and send me a screenshot. BS 154 is an interview with Dr. Alan Castel, author of Better with Age: The Psychology of Successful Aging. In the past we have discussed how our brain changes as we age, but it turns out successful aging requires more than "good genes." Our attitudes and our behaviors have a huge impact. More importantly, it is never too early to begin preparing for successful aging. Send you feedback to brainsciencepodcast@gmail.com or submit voicemail at http://speakpipe.com/docartemis. Episode 153 of Brain Science is an interview with Harvard neuroscientist John Dowling. We talk about his latest book Understanding the Brain: From Cells to Behavior to Cognition with a special focus on Vision. If you listen to this episode in the Free Brain Science mobile app you can also listen to BSP 4, which featured one of Dowling's earlier books, The Great Brain Debate: Nature Or Nurture?. Just look under Extras. For complete show notes and episode transcripts please visit http://brainsciencepodcast.com. Send feedback to brainsciencepodcast@gmail.com or submit voice feedback via Speakpipe. In 2018 nine new books were featured and the subjects covered included memory, peri-personal cells, creativity, language, reading, the cerebral mystique, synapses, happiness, emotion and work of Eve Marder. We had 4 new guests and 4 returning guests along with an encore interview with Dr. Eve Marder. Go to http://brainsciencepodcast.com for complete show notes and episode transcripts. Details show notes and episode transcripts will be available in a few days. BS 150 is my 4th interview with Dr. Seth Grant, the molecular biologist who has discovered surprising things about the evolution of the synapse, including the fact that vertebrates have much more complex synapses than invertebrates. In this interview we talk about his latest paper in Neuron in which his team has developed a method for mapping the synapses across the entire mouse brain. This is called a synaptome and reveals that there is surprising diversity depending on which part of the brain is examined. We discuss the implications of this discovery and how it suggests a new theory of how memory works. Even though this is a follow up to last year's interview (BS 137), Dr. Grant provides all the background that a new listener will need to appreciate his work. Please visit our sponsors Babbel and The Great Courses Plus. Please send feedback to brainsciencepodcast@gmail.com or leave voicemail via http://speakpipe.com/docartemis. The dates in Australia will be May 20-30, 2018 and I have included the PDF with details with this announcement. There is room for 16 listeners. Please write to a brainsciencepodcast@gmail.com for more details. Also, I will be in Boston November 1-3 for the Sound Education event at Harvard. If you would like to get together just drop me an email. BS 148 is the interview with pioneering neuroscientist Dr. Eve Marder, which I originally recorded back in 2009. I am reposting it now as a follow-up to last month's review of Charlotte Nassim's excellent biography Lessons from the Lobster: Eve Marder's Work in Neuroscience. The topics discussed in this interview are just as relevant as they were back then. A highlight of this interview is Dr. Marder's insights into what it was like to be part of the first large cohort of women entering science back in the sixties and seventies. Send feedback about this episode to brainsciencepodcast@gmail.com. Feedback received before December 1, 2018 may be included in the December episode of Brain Science Live on Facebook. Brain Science Live is on Facebook Live the first Thursday of every month at 8PM Central Time, but the audio is recorded for Premium and Patreon supporters. This is an interview with MIT neuroscientist, Dr. Alan Jasanoff about his book The Biological Mind: How Brain, Body, and Environment Collaborate to Make Us Who We Are. We talk about what he calls the "cerebral mystique" and why it is important to remember because the brain is embodied it is not autonomous. The Mind is the result of the interaction of the brain, body, and its environment. Please visit http://brainsciencepodcast.com for full show notes and episode transcripts. Try a free month of The Great Courses Plus at http://thegreatcoursesplus.com/ginger. BS 145 celebrates the return of Dr. Maryanne Wolf who was featured back in BSP 29 when we talked about her bestseller Proust and the Squid: The Story and Science of the Reading Brain. In this episode we talk about her recent book Tales of Literacy for the 21st Century. Our focus is two-fold. First we consider the implications of the fact that while language is acquired naturally, reading is a cultural invention that must be taught. Second, we explore how the brain is changed by reading and consider the consequences of the shift toward digital media. This is a thought provoking conversation that will interest listeners of all backgrounds. For complete show notes and episode transcripts, please visit http://brainsciencepodcast.com. This episode of Brain Science is sponsored by Audible. Please show your support this podcast by visiting http://audible.com/ginger. Don't miss our new monthly Facebook live sessions where listeners can submit questions about past episodes. Learn more at our Facebook Fan Page. Full episode show notes and episode transcripts are available at brainsciencepodcast.com. BS 143 is an interview with Dr. Elkhonon Goldberg, author of Creativity: The Human Brain in the Age of Innovation. We explore the roles of both the pre-frontal lobes and the right cerebral hemisphere, and we consider how the rapid rate of change may actually be decreasing the incidence of dementia by forcing older people to learn new skills rather than getting stuck in the rut of years of "auto-pilot." Show notes and episode transcripts are available at http:brainsciencepodcast.com. Important new announcement: Starting on the first Thursday in April (April 5, 2018) at 8PM Central Time, Dr. Campbell will be hosting a monthly Facebook Book Live session which will be available on her profile page and the Brain Science podcast Fan Page. BS 142 is an interview with neuroscientist Michael Graziano about his latest book The Spaces Between Us: A Story of Neuroscience, Evolution, and Human Nature. We explore the discovery of peripersonal neurons and discover how deeply they are imbedded in our daily lives. Send email to brainsciencepodcast@gmail.com or submit audio feedback at http://speakpipe.com/docartemis. This episode will be discussed on the Brain Science Podcast Fan Page via Facebook live on Thursday April 12 at 8PM Central Time. BS 140 is our 11th Annual Review episode. We look back at the highlights from 2017. New listeners will get a good feel for the ideas and guests that appeared, while regular listeners will have a chance to review a few key ideas. This year I also include a few highlights from the 2017 annual meeting of the Society for Neuroscience. Please visit http://brainsciencepodcast.com for detailed show notes and episode transcripts. Send email feedback to brainsciencepodcast@gmail.com. Jeff Hawkins founded Numenta in 2005, shortly after publishing his best seller "On Intelligence." Numenta's goal is to create a computer model of how the human cortex functions and more importantly advance our theoretical understanding of why it has the structure that it does. In BS 139 Hawkins describes some of his team's latest research and some exciting new ideas. Complete show notes and transcripts are available at http://brainsciencepodcast.com. Send feed back to brainsciencepodcast@gmail.com or via Speakpipe. BS 137 Seth Grant: "Genetic Lifespan Calendar"
In BS 137 neuroscientist Seth Grant describes his surprising new discovery that brain complexity is controlled by a "genetic lifespan calendar" that determines the timing of brain changes through out the lifespan. We also explore the exciting implications of this discovery. Our new sponsor is The Great Courses Plus. For a free month of video streaming and downloads go to http://thegreatcoursesplus.com/ginger. Note for Premium Subscribers: The episode transcript for BS 137 will be released later this week. In Brain Science 136 we discuss "Language at the Speed of Sight: How We Read, Why So Many Can’t, and What Can Be Done About It" by Mark Seidenberg. We consider the disturbing gap between our scientific knowledge of reading and current education practices in the US. This episode will provide the listener with some important basics about how reading changes our brains and what is known about how children learn to read. Learning to read is not as automatic as learning to talk and when problems arise, early intervention is essential. We also consider some of the fascinating differences between written languages and how they reflect underlying differences between spoken languages. Plus---- Why speed reading is as myth! Check out the free Brain Science Mobile app for extra content. For more references and episode transcripts please visit http://brainsciencepodcast.com. This episode features Dr. Lisa Feldman Barrett, author of How Emotions Are Made. We discuss the evidence AGAINST the classical theory that emotions are universal and hardwired, as well as her new theory of Constructed Emotions. This new theory has significant implications for how we understand ourselves and others. Detailed show notes are available at http://brainsciencepodcast.com. Bonus Content is available for Premium Subscribers and Patreon supporters. Please send feedback to brainsciencepodcast@gmail.com. Dr. Jaak Panksepp, pioneer of Affective Neuroscience died in April 2017 at the age of 73. Because he was one of our most popular guests we are replaying his first interview from 2010. Please visit Brain Science website for detailed show notes and links to transcripts. Here are links to the show notes for his other free interviews. In the next episode we will explore newer theories of emotion, but I think Dr. Panksepp's legacy is worth honoring. Follow Dr. Campbell on Twitter @docartemis. How many neurons does the typical human brain contain? The oft-quoted number of 100 billion turns out to have been a guess that was wrong! By a lot! Dr. Suzana Herculano-Houzel is the Brazilian neuroscientist who developed a revolutionary new technique for accurately counting the neurons in brains of all sizes. She shocked the scientific community when she determined that the average human brain contains only 86 billion neurons, but we still have more neurons in our cerebral cortex than any other species. Learn what all this means in Brain Science 133. Send email to Dr. Campbell at brainsciencepodcast@gmail.com or leave voice feedback at http://speakpipe.com/docartemis. Dr. William Uttal first appeared on the Brain Science Podcast back in 2012. He was a long time critic of over reliance of certain types of brain imaging, especially fMRI, in cognitive neuroscience. Sadly, he died in February 2017, so in his honor I am replaying that original interview. The points he made are just as relevant now as they were 5 years ago. Please send email feedback to brainsciencepodcast@gmail.com. Please visit http://brainsciencepodcast.com for more episodes and transcripts. In this episode we focus on the most recent 5 years of Brain Science, looking back at our guests and topics with a focus on the question What is Mind? Since there is no consensus about this deeply human question, I am sharing how my own thoughts have grown and evolved over 10 years of reading, talking to scientists and philosophers and creating this podcast. Since this is part 2 of our 10 years celebration, I have also included some more listener feedback. Thanks to everyone who has sent me feedback since the show started in December 2006. You are the reason I hope to continue to create new episodes in 2017 and beyond. 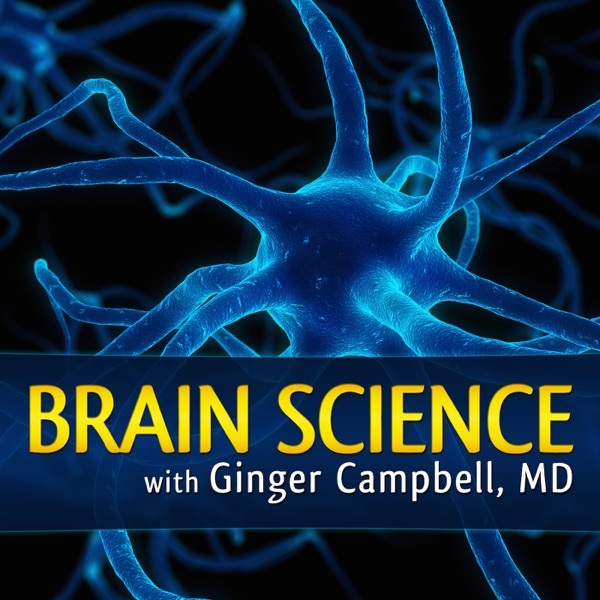 In this episode, Dr. Ginger Campbell celebrates The Brain Science Podcast/Brain Science's 10 year anniversary. This episode focuses on the first 5 years of the podcast. Find out how the show got started and listen as Dr. Campbell shares some of her most memorable episodes. We also have some listener feedback, so join us for the celebration! Send Dr. Campbell feedback at brainsciencepodcast@gmail.com. Post a review in iTunes, Stitcher, or your favorite app store and send us a screen shot to enter the drawing of a year of free Premium Content. Also, if you enjoy our sponsor Audible.com, please check out Permanent Present Tense: The Unforgettable Life of the Amnesic Patient, H. M. by Suzanne Corkin. In episode 129, Dr. Brenda Milner comes on the show to talk about her life's work and her most famous experiments. Dr. Milner was a pioneer in the field of neuropsychology and in the study of memory and other cognitive functions in humankind. She studied the effects of damage to the medial temporal lobe on memory and systematically described the deficits in the most famous patient in cognitive neuroscience, Henry Molaison, formerly known as patient H.M.She has made major contributions to the understanding of the role of the frontal lobes in memory processing, in the area of organizing information. In episode 128, Jon Mallat is here to talk about the book he co-authored, "The Ancient Origins of Consciousness: How the Brain Created Experience". The focus on this conversation is on primary consciousness, the most base form of consciousness. We differentiate between the types of consciousness and utilize and inter-disciplinary approach to the science behind how the brain creates experiences, thus attempting solving the hard problem of consciousness. Are humans the only sentient beings? Find out in this insightful discussion! Brain Science (formerly the Brain Science Podcast) has been on a 6 month hiatus. This short audio provides information for both new listeners and longtime fans. I talk briefly about the background and content of the show. Then I explain how to get more out of our website at http://brainsciencepodcast.com. Finally I review all the options for supporting the show. Feel free to send questions and feedback to brainsciencepodcast@gmail.com. BSP 127 is a follow-up to BSP 122, which was an interview with Fabrizio Benedetti, author of Placebo Effects: Understanding the mechanisms in health and disease. in this new interview we discuss some of Dr. Benedetti's most recent research into placebo effects involving pain and high altitude headaches. We also discuss some of the ethical issues surrounding the use of placebos. Please visit http://brainsciencepodcast.com for complete show notes and episode transcripts. Send feedback to brainsciencepodcast@gmail.com. The next episode of the Brain Science Podcast will be published in September 2016. If you need something to listen to while you are waiting checking our website for back episodes or visit http://booksandideas.com to listen to my other podcast. Thanks for listening. Episode 126 is an interview with Andy Clark, author of Surfing Uncertainty: Prediction, Action, and the Embodied Mind. Our focus is on integrating a predictive model of the brain with the principles of embodied cognition. Clark makes these topics accessible to listeners of all backgrounds. The transcript for this episode is FREE. In BSP 124 philosopher turned neuroscientist Michael Anderson talks about his new book "After Phrenology: Neural Reuse and the Interactive Brain." One of the most surprising recent discoveries in neuroscience has been that every part of the brain actually participates in multiple coalitions and functions. This means asking WHERE a certain function is located or WHAT a particular region does are obsolete questions. While the book is quite technical our conversation presents the key ideas in a way that will be accessible to listeners of all backgrounds. We also consider how neural reuse fits into the embodied cognition approach that we have discussed in previous episodes. BSP 123 is an interview with Anthony Chemero, author of Radical Embodied Cognitive Science and Phenomenology: an Introduction. Our focus is gaining an appreciation for phenomenology as a living philosophical tradition that is making valuable contributions to cognitive science. Click here for Free Episode Transcript. Related episodes are also available at http://brainsciencepodcast.com. This is a replay of the interview with Dr. Fabrizio Benedetti, author of Placebo Effects: Understanding the mechanisms in health and disease and The Patient's Brain: The neuroscience behind the doctor-patient. We talk about the neurobiology of placebos, including the fact that they produce objective changes in the brain and body. Send feedback to brainsciencepodcast@gmail.com or post comments in our discussion forum on Goodreads. Follow Dr. Campbell on Twitter where she is @docartemis. Due to circumstances beyond my control the next full episode of the Brain Science Podcast will be delayed until mid-late September. This announcement explains why and also includes important information about BSP 121 (a revised version is available). It also explains some recent changes in the Premium Subscription. Finally the last 16 minutes shares some personal memories about my husband Dr. Dennis G Smith. For detailed show notes please go to http://brainsciencepodcast.com. BSP 121 is an interview with AD (Bud) Craig, author of "How Do You Feel? : An Interoceptive Moment with Your Neurobiological Self." Dr. Craig has made some surprising discoveries about how information about our body's inner state (interoception) reaches our awareness. We talk about the implications of these discoveries for understanding both consciousness and mental illness. Would you like to win a FREE year of PREMIUM? Go to http://brainsciencepodcast.com/premium to learn how. Send Dr. Campbell feedback at brainsciencepodcast@gmail.com or follow us on Twitter (@docartemis). You can also post the thread on Goodreads at http://www.goodreads.com/topic/show/17025846-bsp-121-bud-craig. Discuss this episode on Goodreads. Sign up for the free BSP newsletter. BSP 120 is the second half of my interview with Dr. Ed Taub, pioneer of Constraint-Induced Movement Therapy (CI Therapy), which is a revolutionary approach to rehabilating people with stroke and other brain injuries. If you are using the free Brain Science Mobile App be sure to check this episode's extras for additional free content (BSP 10). Sign up for our free newsletter at http://brainsciencepodcast.com/newsletter-. BSP 118 provides an accessible introduction to neuroantomy for listeners of all backgrounds. It is an edited version of BSP 32, which was a discussion of "Beyond the Zonules of Zinn: A Fantastic Journey Through Your Brain" by David Bainbridge. Please visit http://brainsciencepodcast.com for complete show notes and episode transcripts. BSP 117 is an interview with pioneering neuroscientist Dr. Michael Gazzaniga. We focus on his new autobiography "Tales from Both Sides of the Brain: A Life in Neuroscience." The most recent 25 episodes of the Brain Science Podcast are FREE, but Premium Subscribers have unlimited access to all episodes and transcripts. Learn more at http://brainsciencepodcast.com/premium. BSP 116 Norman Doidge, MD on "The Brain's Way of Healing"
BSP 116 is an interview with Dr. Norman Doidge about his new book "The Brain's Way of Healing: Remarkable Discoveries and Recoveries from the Frontiers of Neuroplasticity." In his previous bestseller, "The Brain That Changes Itself," Dr. Doidge featured that scientific pioneers who proved that our brains remain plastic throughout our lives. In his new book he features clinicians who are exploring new treatment approaches that tap into that plasticity. We also explore some of the obstacles to the acceptance of methods that many still consider fringe. BSP 115 is an interview with Evan Thompson about his new book Waking, Dreaming, Being: Self and Consciousness in Neuroscience, Meditation, and Philosophy. The Brain Science Podcast celebrated its eighth anniversary on December 5, 2014, which makes this our 8th annual review episode. Topics discussed in 2014 included brain plasticity, the interaction of cognition and emotion, sleep, consciousness, "neuromania," exercise and the brain, and mirror neurons. This episode provides a review for regular listeners and gives new listeners an idea of what's available in episodes 105-113. Please visit http://brainsciencepodcast.com for complete shownotes and episode transcripts. Special Note: The transcript for this episode is FREE. It is included in the Episode Extras on our Free Mobile app or JUST CLICK HERE. Please vist http://brainsciencepodcast.com for complete show notes and episode transcripts. Go http://brainsciencepodcast.com for detailed show notes and episode transcripts. BSP 111 is an interview with Dr. John Ratey, author of "Spark: The Revolutionary New Science of Exercise and the Brain." This is an edited version of an interview that was first posted back in 2008 (BSP 33), but the content remains extremely relevant. Detailed show notes and episode transcripts are available at http://brainsciencepodcast.com. Please share your feedback about this episode by sending email to brainsciencepodcast@gmail.com or going to the Brain Science Podcast Discussion Forum at http://brainscienceforum.com. You can also post to our fan pages on Facebook or Google+. Click here to learn more about how to all the older episodes of the Brain Science Podcast. BSP 110 is an interview with Dr. Frank Amthor, author "Neuroscience for Dummies" and "Neurobiology for Dummies." In this interview we discuss a wide variety of topics from neurobiology including what makes neurons special and how brains differ from current computers. This episode is appropriate for listeners of all backgrounds. Completer show notes and episode transcripts are available at http://brainsciencepodcast.com. Please post feedback at brainscienceforum.com or send email to brainsciencepodcast@gmail.com. If you use the Brain Science Mobile App be sure to check the episode extras for free Premium content. This is an episode of my other podcast, Books and Ideas. It is an interview with Dr. John Ratey about his latest book "Go Wild: Free Your Body and Mind from the Afflictions of Civilization." It isn't about neuroscience per sebut I think it will interest many of you, especially if you are interested in how your lifestyle choices effect your brain and overall health. This transcript for this episode is FREE. Please visit http://booksandideas.com for more episodes. The next episode of the Brain Science Podcast will be released in late July 2014. For the last 7+ years the Brain Science Podcast has been exploring how neuroscience is unraveling the mystery of how our brains make us human. Episode 109 was inspired by several recent books that explore the hazards of thinking that neuroscience is the ONLY path to understanding. Send your feedback to brainsciencepodcast@gmail.com. Send feedback to brainsciencepodcast@gmail.com or post your comments on our Goodreads Group at http://brainscienceforum.com. Episode 106 of the Brain Science Podcast is an interview with Luiz Pessoa, author of "The Cognitive-Emotional Brain: From Interactions to Integration." We explore the evidence that cognition and emotion are deeply intertwined at all levels of the brain with a focus on the evidence that the amygdala and thalamus do more than has been traditionally assumed. Although this episode is somewhat technical, the key ideas are accessible to listeners of all backgrounds. For full show notes and episode transcripts please visit http://brainsciencepodcast.com. Use the coupon code BSP-500 for a 50% discount on our new Premium Subscription. BSP 105 is an interview with Dr. Michael Merzenich, author of "Soft-Wired: How the New Science of Brain Plasticity Can Change Your Life." Use the coupon code BSP-50 for a 50% discount on any new Premium Subscription. NOTE: This episode has been reposted with improved sound levels. Please download it again if you got it before January 31, 2014. I first interviewed Olaf Sporns, author of Discovering the Human Connectome, back in BSP 74. This episode is a followup interview that focuses on recent advances in the rapidly evolving field of Connectomics. We talk about the field's challenges and promise, including the importance of network theory as a tool for dealing with the huge amounts of data being generated by researchers. BSP 102 is an interview with Dr. Allen Frances, author of "Saving Normal: An Insider's Revolt Against Out-of-Control Psychiatric Diagnosis, DSM-5, Big Pharma, and the Medicalization of Ordinary Life." We talk about the factors that are driving the over diagnosis of certain mental illnesses while at the same time many people who really need psychiatric care do not receive it. This is a sobering discussion that closes with practical advice for both patients and those who care for them. Show notes and episode transcripts are available at http://brainsciencepodcast.com. This is a followup to BSP 51 in which UK researcher Seth Grant told us about his work exploring the evolution of the synapse, which is a key structure in both invertebrate and vertebrate nervous systems. In this Grant updates us on some of his latest research. His findings are both surprising and enlightening. Go to http://brainsciencepodcast.com for full show notes and free episode transcripts. All episodes of the Brain Science Podcast are available via our mobile app, which is now available for iOS, Android and Windows 8 devices. The Brain Science Podcast is sponsored by Audible.com and by listener donations. This episode is a followup interview with Dr. Jaak Panksepp, pioneer of Affective Neuroscience. In a recent episode of the Brain Science Podcast we talked with Dr. Panksepp about his latest book "The Archaeology of Mind: Neuroevolutionary Origins of Human Emotions." In this episode of Books and Ideas we talk about the implications of his research with a focus on how learning that we share basic emotional circuits with other mammals should influence how we treat the animals in our lives. Click here for complete show notes or visit bookandideas.com. The main brain website is http://brainsciencepodcast.com. Episode 92 is the Sixth Annual Review Episode of the Brain Science Podcast. If you have been listening all year you will find this is a great way to revisit and remember some highlights and key ideas. IF you are a new listener this episode provides a nice overview of 2012, which included 10 interviews and 2 additional book reviews. Please visit http://brainsciencepodcast.com for links to all the episodes and the free episode transcripts. Episode 47 of Books and Ideas is being released simultaneously in the Brain Science Podcast feed. It is an interview with Terrence Deacon, PhD., author of "Incomplete Nature: How Mind Emerged from Matter." We talk about the ongoing quest to explain the emergence of life, mind, and purpose using the known laws of physics (with out the need for any supernatural extras). Click here for complete show notes or visit booksandideas.com. You can send Dr. Campbell feedback at gincampbell at mac dot com or post feed on the Books and Ideas Fan Page on Facebook. BSP 83: William Uttal: Is brain imaging the new phrenology? Episode 83 of the Brain Science Podcast is an interview with William Uttal, PhD, author of "Mind and Brain: A Critical Appraisal of Cognitive Neuroscience." We look critically at the current role of brain imaging and why it falls short as a tool for unraveling the mystery of how mind emerges from the brain. Send feedback to Dr. Campbell at brainsciencepodcast@gmail.com. She is also @docartemis on Twitter. In BSP 80 we look back at Year 5 of the Brain Science Podcast. We also reflect on what we have learned about brain health. This episode contains useful information for both new listeners and long-time fans. I am putting Episode 43 of Books and Ideas into the Brain Science Podcast feed because it should be of interest to BSP fans. This episode is an interview with Carol Tavris, PhD, co-author of . We talk about the relationship between psychology and neuroscience as well as cognitive dissonance, which is the subject of Dr. Tavris's recent book Mistakes Were Made (But Not by Me): Why We Justify Foolish Beliefs, Bad Decisions, and Hurtful Acts. For detailed show notes including references go to http://brainsciencepodcast.com. I have included Episode 25 of Books and Ideas in the feed for the Brain Science Podcast because it is a discussion of the alleged connection between vaccines and autism. In this episode I interview Dr. Paul Offit, author of "Autism's False Prophets: Bad Science, Risky Medicine, and the Search for a Cure." Despite overwhelming scientific evidence against a relationship between vaccines and autism, vaccine opponents continue to frighten and confuse parents. Meanwhile we are beginning to see the re-emergence of preventable and potentially life-threatening diseases among the increasing numbers of unvaccinated children. Dr. Offit's book provides a thorough discussion of the science and politics of the controversy. I hope this interview with motivate you to read "Autism's False Prophets" and to share it with others. For detailed show notes go to http:gingercampbellmd.com/. Episode 52 of the Brain Science Podcast is our Second Annual Review Episode. We review the highlights of 2008 and also talk briefly about our plans for 2009. The episode is aimed at all listeners, but should be especially helpful for newer listeners because there is an extensive discussion of the other on-line resources available to listeners including our website and Discussion Forum. Go to http://brainsciencepodcast.com for detailed show notes and links. Send email to docartemis at gmail.com or post feedback in the Discussion Forum at http://brainscienceforum.com/. This is a brief promo to remind you to check out my other podcast Books and Ideas. Episode 19 is an interview with Dan Ariely best-selling author of Predictably Irrational: The Hidden Forces That Shape Our Decisions. You can find all the episodes in iTunes or by going to http://booksandideas.com/. What was your favorite episode? What was the most important or interesting thing that you learned this year from listening to the Brain Science Podcast? Share your thoughts at the Discussion Forum at http://brainscienceforum.com. For detailed show notes including a list of all the episodes aired in the past year go to http://brainsciencepodcast.com. Episode length is approximately 24 minutes. There is a promo on the end for Mur Lafferty's new novel, Playing for Keeps. I want to thank Mur for inspiring me to start podcasting.